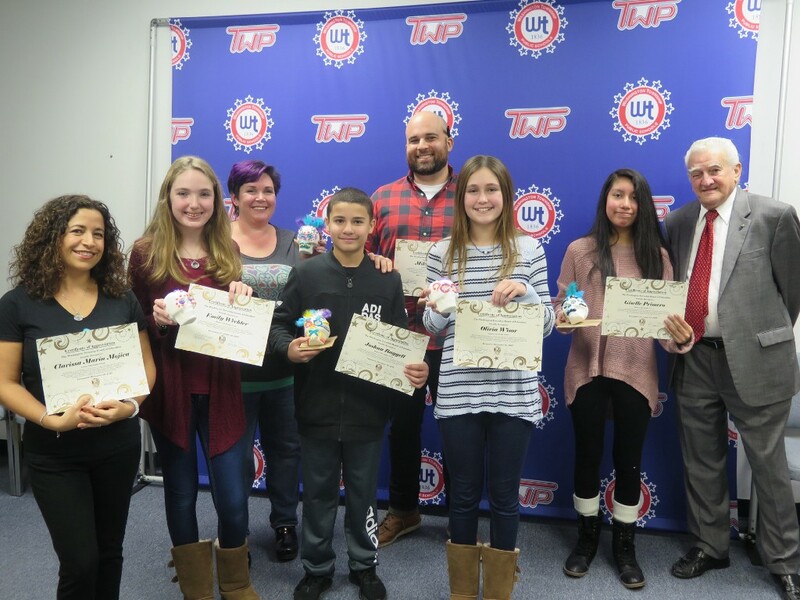 Bunker Hill Middle School and Washington Township High School students honored at the Dec. 19 meeting. The Dec. 19 Board of Education meeting featured a variety of presentations and recognitions, as students from both Bunker Hill Middle School and Washington Township High School demonstrated projects and programs before the board. Student success was not the only acknowledgment of the night, however, as members of the board also honored Roy Dawson, whose position will be replaced in 2018, as he did not seek re-election in the fall. Bunker Hill Middle School Principal Mike D’Ostilio, joined by art teachers Bethany Franz and Mike Morro, as well as Spanish teacher Clarissa Marin-Mojica and students, presented to the board the school’s interdisciplinary activity of creating sugar skulls in honor of the cultural traditions of “Dia de los Muertos,” or “Day of the Dead,” observed in Mexico and many Hispanic cultures. Marin-Mojica said through cultural projects and activities such as this, which resulted in approximately 300 total skulls, the school is able to prove diversity within the township, as well as help students better understand and become aware of different cultures. At the meeting, the teachers, as well as a few participating students, demonstrated exactly how the skulls were made by hand in the school-wide activity, and painted them for the board to see. 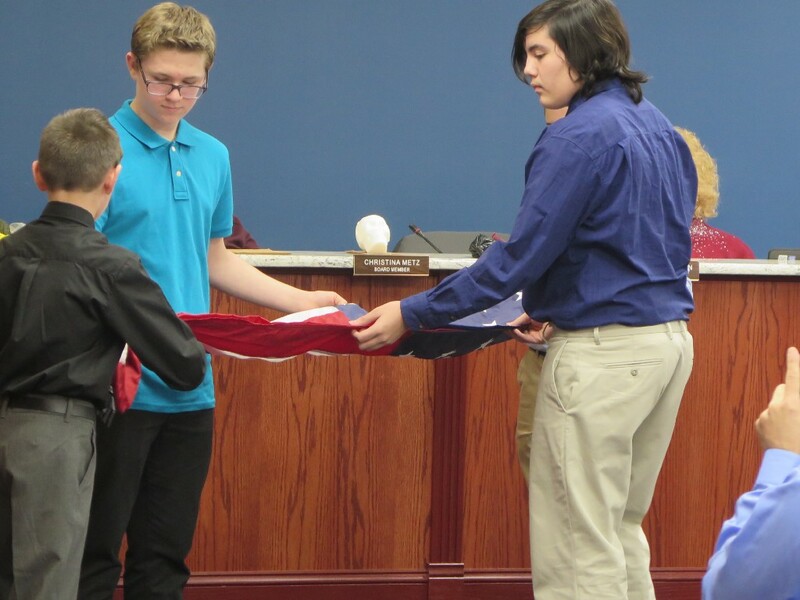 Bunker Hill students, from left, Drew Dolgos, John Franklin and Jaxson Dunn demonstrated the proper technique for folding the American flag at the December Board of Education meeting. Additional Bunker Hill Middle School students were honored by the board for their dedication to raising and lowering the flag every day before and after school. According to D’Ostilio, the newly implemented activity was created under the guidance of Assistant Principal Greg Muscelli. “At Bunker Hill, we are interested in educating the whole child, and part of that requires education in regard to citizenship,” Muscelli said. Initially in October, cadets in the high school Junior Air Force ROTC demonstrated to the middle school students the proper decorum for folding, raising and lowering the flag. Muscelli said at this time, approximately 12 students in sixth through eighth grade participate in the program, which they hope will continue for years to come. The students demonstrated the folding of the flag to members of the board at the meeting, and proceeded to donate the flag to veteran and board Vice President Bob Abbott. WTHS engineering students Juliana Andrews, Lauren Crane, Laura Dressel, Lindsay Hager, Morghan Harris, Jessica Levin, Emily McFalls, Victoria Nelson, Emily Pancoast, Maia Pawlowski, Morgan Smith, Paige Tatus, Ma Katherine Tenido, Jillian To, Kayla Webster and Caroline Zimmerman joined teacher Simone Wong and Board of Education president Ginny Murphy for a photo following their presentation. 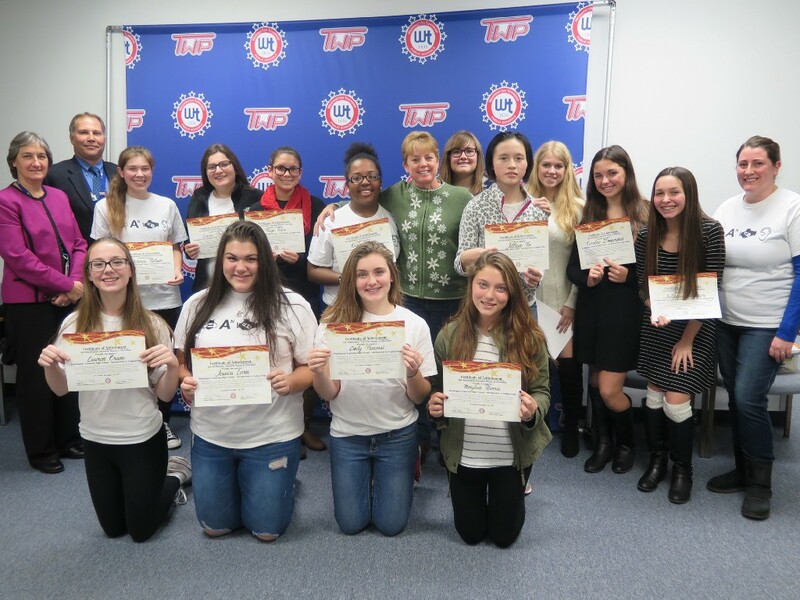 An all-female introduction to engineering class at Washington Township High School was also recognized at the board meeting, celebrating its seventh year in existence. “As we know, women are an underrepresented group in engineering, and with your support and our administration, we’ve been able to have a class like this for a few years now,” said Steve Whalen, district supervisor for career and technical education. The students showcased their skills in creating “bath fizzies,” illustrating the step-by-step process of creating the custom molds through prototypes and 3D models, finally resulting in a bubbly product for bathwater. Following the student presentations and demonstrations, Murphy presented a plaque to Dawson, whose term ended after three years and eight months on Dec. 31. 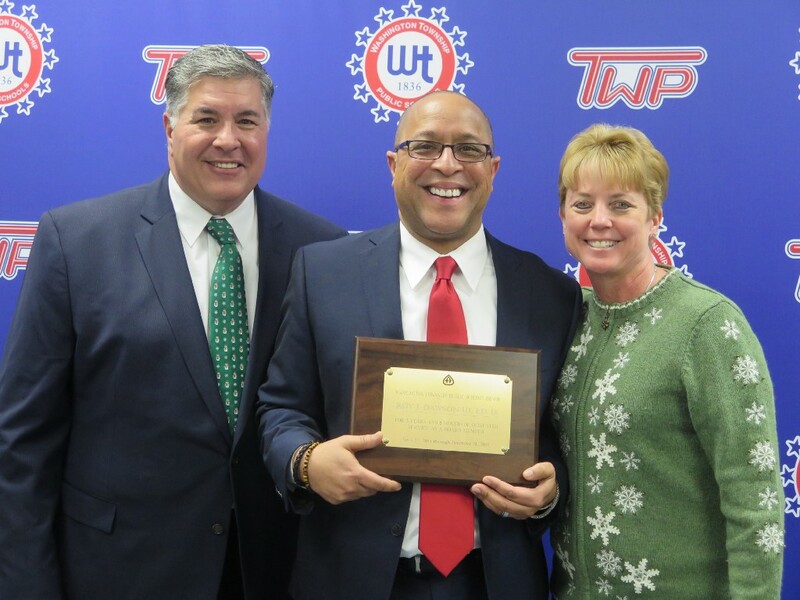 Superintendent of Schools Joe Bollendorf (left) and Board President Ginny Murphy (right) recognized Roy Dawson for his service to the Washington Township Board of Education. Dawson joined the board on April 22, 2014, and will be replaced by newcomer Raymond Dinovi Jr. at the reorganization meeting scheduled for Jan. 2, at 7 p.m.
• The Board of Education unanimously approved the creation of an NAACP High School Youth Chapter at Washington Township High School. • The Board of Education approved Lamont Robinson’s letter of resignation as head football coach at Washington Township High School, effective Dec. 15.